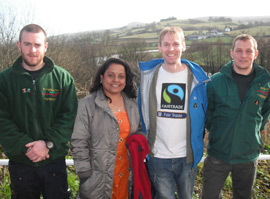 I’ll be joining up with the original Fair Trade Way pioneers as they walk their 90 mile route up through Lancashire and Cumbria next week. They are starting tomorrow and finishing on Wednesday with inspiring storytelling sessions along the way each day. I will be taking along solidarity greetings from Wales Fair Trade walkers when I join them for the Bowness to Grasmere section on Tuesday. Go to http://www.oxfam.org.uk/fairtradeway for more details.